The plaque says it's dedicated to the Pioneer's of Maleny and district, but it doesn't say exactly what it is. It may look like a gun, but it's not, and it has hooks on it for cables, I have no idea what to make of it. I like the big disk wheels though. "The thing" in WA at least is called a "Whim" and is towed behind a bulldozer to tow logs logs out of the bush. I think the log is winched up under the arm to prevent the end digging in. Those are cool big wheels. 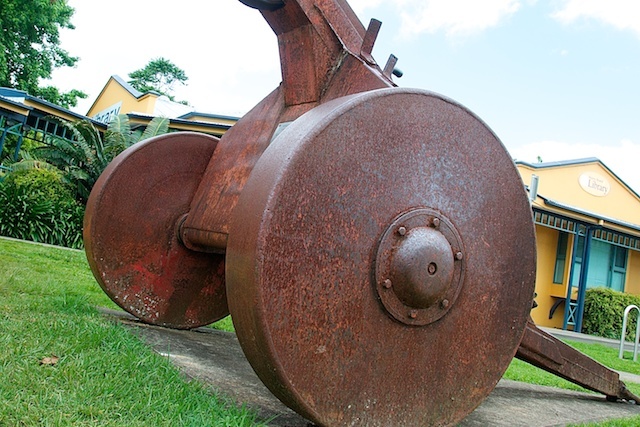 Was Maleny part of a gold-rush? Could this be some sort of mining related machinery? I wondered whether it might have been a chaff cutter or harvester of some sort but I cant see the front of it.